For the second time in six months, the Beltsville Domes was host to an overnight camping festival in easy reach of Washington, DC, Baltimore and the University of Maryland. This summer’s Funk E Fest, hot on the heels of May’s DomeFest, was a raging welcome-back party to the students making their way to College Park to start the fall semester. Starting the (extraordinarily long) day off right, I followed to the strategically-placed “DOMES CONCERT” signs to get to the Domes in time for Shook to do their Baltimore thing. Their set was perfectly suited for the crowd, which was comprised mostly of “chillers” – kids on blankets taking advantage of the seemingly endless beer (at least for those of age) – and funk-positive atmosphere. The humidity was rough, but as the evening started to cool down, the funk started to heat up. The majority of Funk E’s attendees came from College Park, so it was appropriate that many of the festival acts are current or recently-graduated UMD students. Fivestock, whose tagline is “Rock n’ roll from College Park,” is comprised of five Maryland seniors who may be the ones single-handedly keeping the funk alive around campus. In fact, their keys player, Ben Curwin, is one-half of GrooveHouse Productions (the coordinators of DomeFest and Funk E Fest). The set featured a lot of Fivestock’s more familiar material, including songs like Panda and Off My Mind, while also being studded with some familiar covers, including Edgar Winter Group’s Frankenstein. Between each set, DJs kept the crowd alive and grooving. With styles ranging from pop to deep trance, with some dubstep thrown in for the whomp of it, the set breaks were a great source of variety for Funk E Fest attendees who came less for the music and more for the extra-curricular activities. A highlight of the festival was Joe “The Late Bloomer” Keyes and the Late Bloomer Band. Newcomers to College Park, the Late Bloomers still came highly recommended as a funk act not to miss. The band captivated the crowd with soulful grooves more reminiscent of New Orleans than Baltimore, where the band is based. Though Keyes claims he’s a late bloomer, in this case it’s better late than never. His voice carried through the entire campsite, so even those on the furthest stretches of the property were connected to the set. As the sun went down, the funk quotient went way up with Pigeons Playing Ping Pong. Comprised of four graduates of the Maryland higher education system, Pigeons rocked the flock with well-placed covers and well-tuned originals. The set opened with Funk E. Zekiel, who I postulate is the festival’s namesake; a fair guess given that lead guitarist Jeremy Schon is the other half of GrooveHouse Productions. 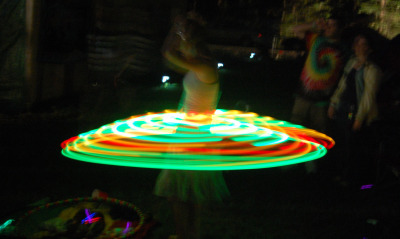 The crowd got loose to the fan-favorite cover of Ghostbusters, as well as the relatively new addition Funkytown, which met with roaring approval, that is if glow stick wars and sparkler-wielding dancers are signs of crowd enjoyment. Though the band started with humble beginnings as a duo playing basements in College Park, they now are a mature band with a refined sound and a funky get-down that they’ve carried to Baltimore, DC, and New York City, just for starters. Festival headliner Lionize does incredible things. With a sound that leans more towards reggae than traditional alternative rock, although still showing heavy influence from both, Lionize took the crowd’s energy from Pigeons and morphed and shaped it into something nearly tangible. Their songs are the kind you feel like you already know the words to, but you don’t, so you just gyrate with your eyes closed as the music flows up into your happy places. The talk of the festival was late-night act Silo Effect. Coming out from Richmond, the band was rumored to sound like Lotus and funk like the seventies. All this was true but the rumors hadn’t mentioned the light show. Shapes of all sizes and colors were beamed out onto the trees behind the camping area, turning the campsite into less of a field and more of a venue. Though the crowd had slimmed considerably by this time, the spirit was raging with happiness, fun and readiness to party. The Domes aren’t exactly a popping spot. In the middle of residential Beltsville, it’s hard to imagine one is going to find a successful outdoor venue. Funk E Fest, however, showed that the well-selected bands could bring the party anywhere. The light show, sound quality and festival amenities brought Funk E Fest well beyond the bounds of a student party.